You can read part 1 of the hide tanning series here, and part 3 here. 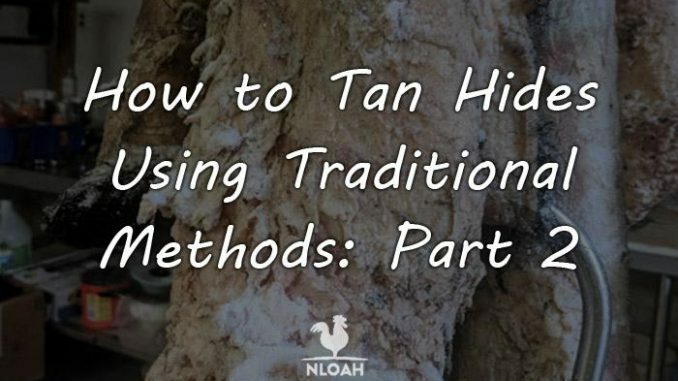 During the first segment in the New Life on the Homestead hide tanning series we shared some particulars about why and how the process is done and an overview of the tools necessary to get to work on hide tanning projects. In the first segment of this series, we shared instructions for tanning hides using chemicals. 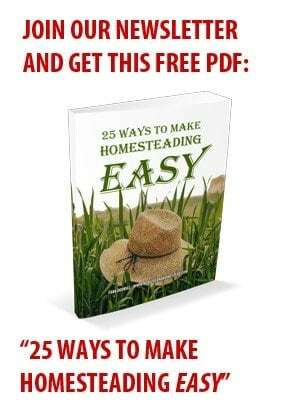 It works great, but I, like many homesteaders, prefer to keep as many chemicals as possible off of my land, away from my livestock, and out of my garden. Tanning hides using traditional and more natural methods is almost always less expensive and does not really add any extra time or work to the project. Hide tanning is a process, one that will always require extensive manual labor and lots of patience. There just are not any true shortcuts, regardless of what type of method you use, when tanning at home. The brain paste tanning method will be the used as an example of natural tanning while detailing the process below. Other natural tanning agent recipes that can be used in place of the brain paste, will be described after the step-by-step instructions. Before you start tanning the hide, you must decide if you want to leave the hair on to take it off. When you are working with a large hide, like a cow hide, or making a small project, you can do both with a single hide. Photo: this rather unpleasant photo depicts what a lye rash – or chemical burn, looks like. The photo does not do it justice, my hands were really red and this one was swollen. Trust me folks, you do NOT want a lye rash. I had my heavy duty work gloves in my pocket, that I keep there for barn chores, and just slipped them on when I started working the hair. That was such a rookie mistake. The gloves are great for protecting my hands from deep barbed wire cuts, but do nothing to keep the dampness from the fur off of my skin. I treated the rash with orange juice, you need something acidic to counteract the chemicals. Orange or lemon juice will work, or lemon essential oil. 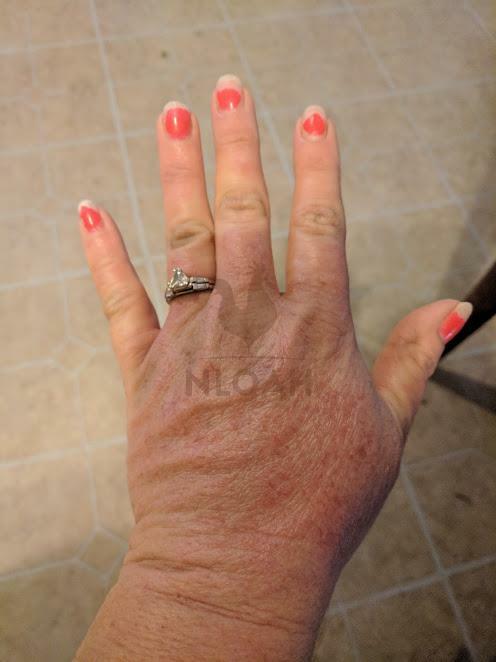 Later that same evening, I coated my hands with my homemade miracle salve – 3 parts Petroleum Jelly and 1 part turpentine. My hands are still sore and cracked, but they no longer shock people. The lye rash should be gone in just a few days. The cow hide I am tanning now will be used to make multiple pairs of moccasins for Christmas presents. Yes, at the time of publishing, it is only February. I am getting a very early start this year on homemade from the homestead Christmas present in an effort to save my sanity and to never again go an entire month on only four to five hours of sleep. When I hung up the hide to salt it, I took a few measurements and decided how much fur I would need to line all of the moccasins I will be making. Next, I cut the necessary amount of fur off the hide so it could be processed and tanned separately from the portion of the hide I am going to de-fur. 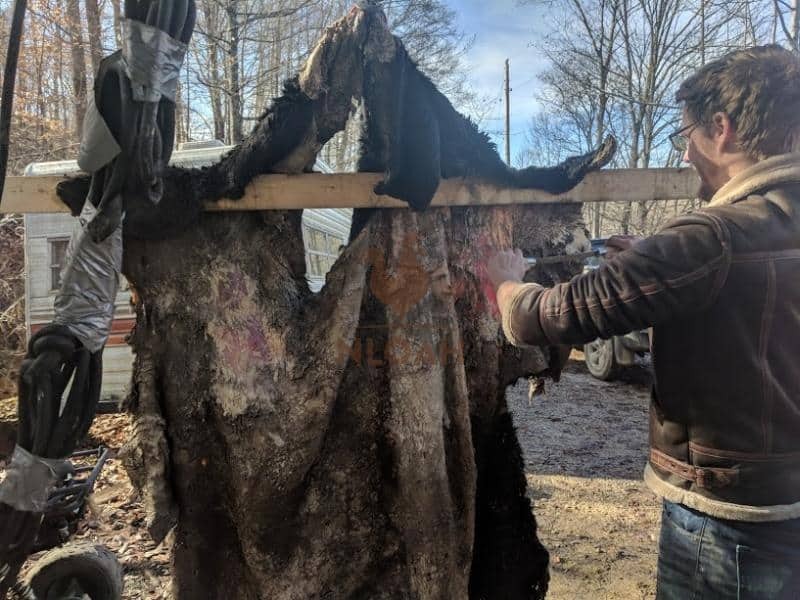 If you hide is not going to be kept frozen until it is ready to tan, you must lay, hang, or stretch it out flat and salt it to preserve the hide. It can take several days for a large hide to thaw completely and should be salted while thawing, as well. A hide that is not salted and left in a crumbled bunch while thawing, or scraped over the course of several days while hanging or laying flat without being salted, can deteriorate quickly, attract both wild predators and bugs, and cause the fur to mildew, rot, and eventually fall out over time. Never use odized salt when tanning a hide, it will usually stain the it. Never use rock salt to preserve a hide, it will not only usually stain it, but eat into the hide, as well. A fine, non-iodized salt, like the inexpensive hay and livestock salt, is the type of salt most frequently used and it works great. Working with a hide when it is still fresh after butchering is highly recommended. When a hide is allowed to hold moisture for too long, it will begin to decompose and rot can begin, especially in tight spaces like around the tail and ear sections. There are multiple ways to de-fur a hide without resorting to the use of commercial chemicals. The method I prefer to use has a wood ash base. Our wood stoves provide ample wood ash on a regular basis, making the material both free and an easy to store resource. Photo: This is one heaping wood stove collection pan full of cooled wood ash. It use approximately five tray’s worth of wood ash to make the de-furring soaking solution for a large hide. To prepare a hide for de-furring using wood ash, I mix together 1 part wood ash with 2 parts water in a livestock tank. When the wood ash dissolve in the water, a lye solution is created. Place the hide in the solution for about 48 hours to vastly loosen the hair. 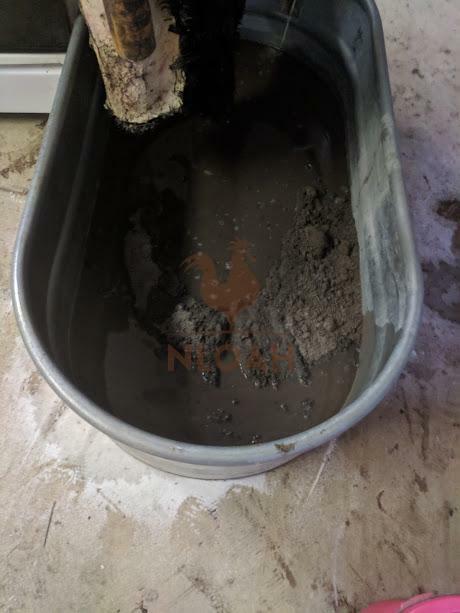 Photo: when you see bubbles form on the surface of the wood ash and water solution, the ratio has reached the right point and lye is being released. It is now time to place the hide into the solution and add another layer of the solution on top – if you are processing a large hide. If you are processing a small hide, place it in the mixture and then put a brick or cinder block on top to prevent the hide from floating to the surface. The hide must be able to move freely completely unfolded in the water or be as unfolded as possible, stirred, and refolded another way, if it is a large hide – like the massive Black Angus cow hide I am currently working on to make the moccasins. The weight of the hide will increase as it absorbs the lye solution, making it more difficult to lift, especially if it is a large hide. I use my husband’s butcher shop and place the wood ash and water bath directly below where the hide is already hanging on ceiling meat hook wenches. I take the hide off of one hook, leaving it on the other, and simply press a button to lower it into the water, raise it, and put it back into the water folding it in a different manner to make sure it is thoroughly soaked. Cheating? Maybe, but I prefer to always work smarter not harder and love being able to manipulate even large hides all by my ownself. You could rig up a similar and temporary system if you have a truck or ATV with a wench and a sturdy tree branch you can swing it over. Once the hide is removed from the lye solution bath, the hair can be scraped away quite easily, substantially reducing the amount of manual labor that would have been involved in the time consuming scraping process. Always wash the hide with warm water or warm soapy water – I use Blue Dawn dish soap, to rinse off the wood ash lye solution. Photo above: never fill your tank more than half-way full with the wood ash de-furring solution before placing a medium or large hide inside. The water level will raise significantly after the hide is placed inside. Wait until the hide is in place to add another layer of solution and add just enough more to cover the top of it. You do not want to slosh all of the lye solution out when stirring or raising and lower the hide in and out of the tank to coat if when dealing with a large hide. You can also add several cups, or more, of agricultural lime to the wood ash and water mix, it is not necessary, but some tanners prefer to do this because in their experience, it helps remove the hair and loosen the gunk left on the hide even more easily. I sometimes add lime to my mix and do believe it helps somewhat, if you don’t have ample wood ash or have a particularly tough hide. Other tanners use only a 2 parts agricultural lime and 1 part water to make a bath to loosen hair and gunk from their hides. 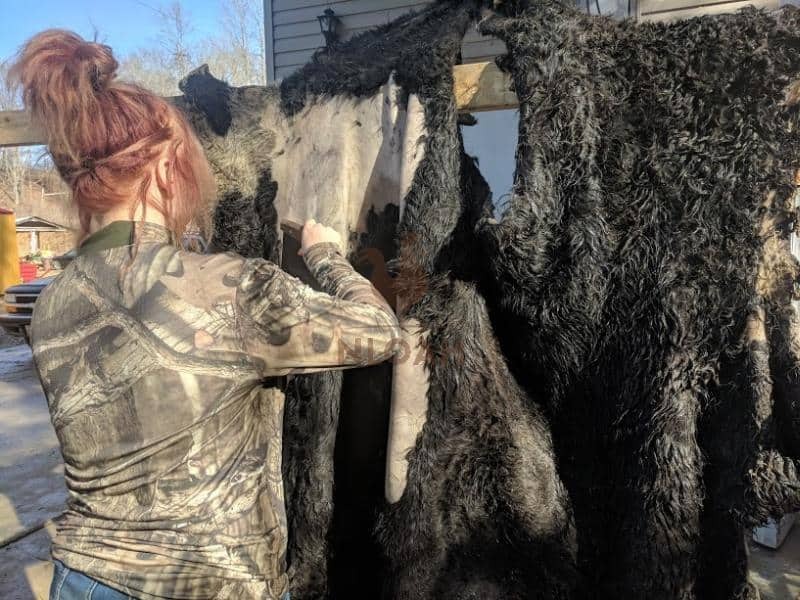 If you choose not to soak the hide to de-fur it, you will need to scrape off the hair using a fleshing knife of some sort and a fleshing beam or stretcher. Fleshing a hide is required to remove all of the membranes, fat, and meat still stuck to it after the butchering process has been completed. 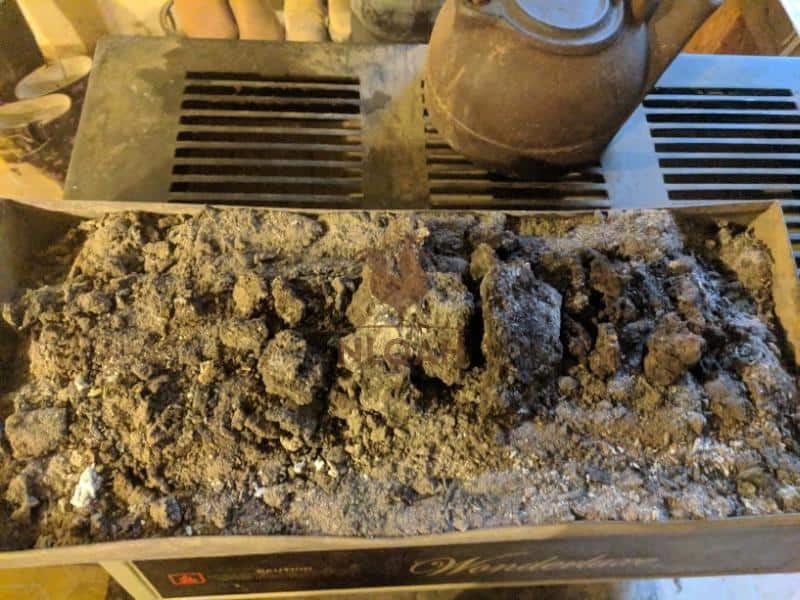 You must remove this organic matter so it does not rot the hide and to allow for the brain solution or other chosen treatment method, to completely saturate the hide. Many tanners use a fleshing beam to remove the gunk still on the hide. The beam is typically a smooth board you scrape the hide over while using a fleshing knife or a somewhat dull draw knife. If you want to go full on buschcraft, used a slightly sharp rock or stick a block of wood on the tip of your favorite hunting, turn it sideways, and use it to scrape the hide clean. This cow hide is in the process of being scraped. My son-in-law and his city boy cousin A.J. (shown in the photo above and the video below) had been scraping for about one hour when this photo was taken. We kept the wood ash soak tub beneath the hide to catch as much of the fat and goo falling off the hide during the scraping as possible. Your homesteading dogs and other critters, will want to munch on the fat. Even though the hide has been washed off after the soak in the lye brine, the goo falling off the hide can still make them very sick, or even kill them. A 2 X 6 board, especially one with a tapered point, is most commonly used when fleshing a hide. I use the same ceiling wench set up I mentioned earlier to flesh small hides and stretch larger hides before fleshing. 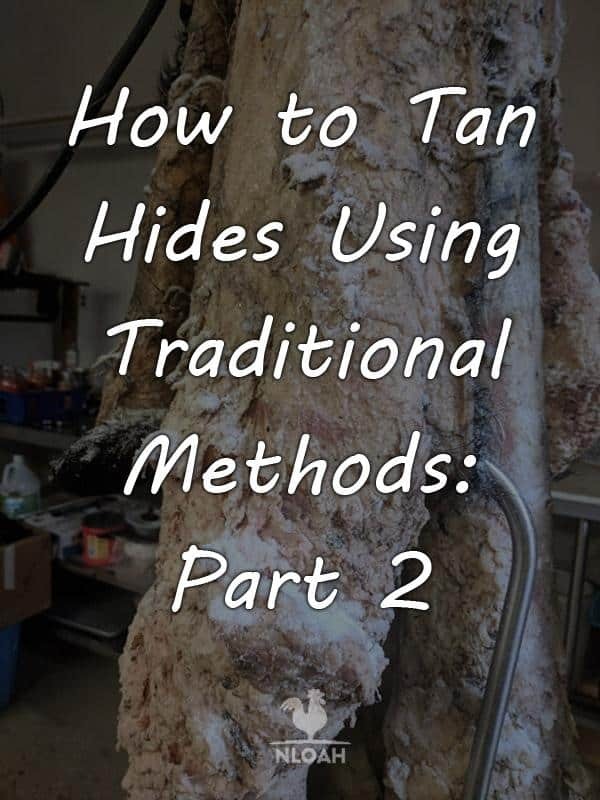 Many tanners prefer to stretch the hide before fleshing it because it is firmly held into place to eliminate movement of the hide and allows you to move from one area of large hides to another without adjusting the hide on a board beam. I also like stretching a hide before fleshing because it allows you to see how your work on the hide is progressing at a glance and better gauge your overall progress and the consistency of your fleshing work. 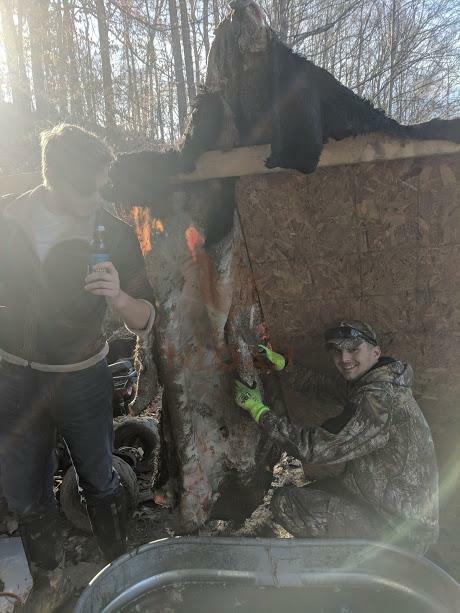 You can build a simple wood frame for fleshing and mount it into the ground with poles, but there isn’t a need to go to all of that bother unless you are going to be doing multiple hides at once and frequently. I simply tack large hides to the side of our wood shed in the winter, early spring, and fall or onto the side of the barn that always remains shady, during the summer months. Always start at the top of the hide when fleshing, and work your way down to the bottom or tail. When fleshing a large hide, do the work in segments, always starting at the top and going to the bottom and then back up again to work on the next segment. Scrape hard enough to remove every last little bit of hair, fat, membrane, or meat, but not so hard that you scratch or cut through the skin. As noted in part 1 of the hide tanning series every animal possesses just enough brains to tan its own hide. If you do not butcher your own meat, ask your butcher to save the brains for your (he or she might charge extra for removing them) or buy brains at the supermarket, they are commonly sold – at least in rural areas. You do not need to use brains from any specific animal when tanning, you simply need enough to coat an entire hide. You can mix different types of brains together to get enough from small animals to cover a large hide. 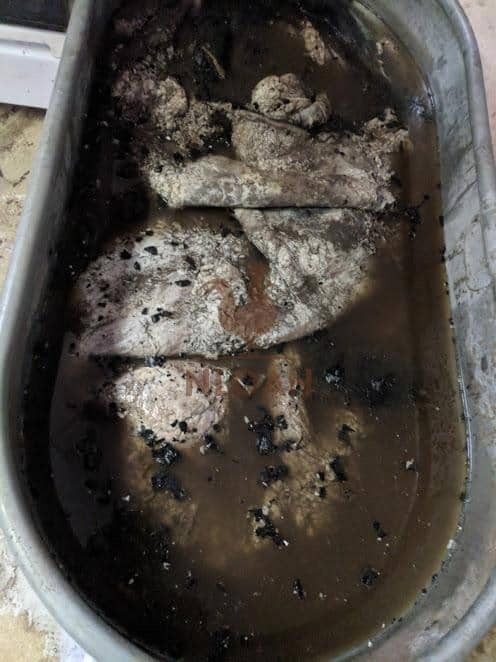 If you luck out and have extra brains solution left after tanning a hide, put it in an airtight container and store it in your freezer until you tan again. To remove the brains from an animal’s skull, split it right down the center – between the eyes. Reach inside the skull and remove both halves of the brain and then carefully pick out any small pieces of bone. The bone chips can easily scratch or cut holes in the hide when the brain solution is rubbed onto it. It is extremely difficult to apply brain paste to a hide that is being stretched, you will loose too much of the mash when it slides down and off of the hide. Always take the hide down and lay it flat to apply the brain paste – or any mash you make to naturally tan an animal hide. If you removed the fur from the hide, you will need to apply the brain paste to both sides of the hide. • Mix the brains in only enough water to make a mash that resembles the consistency of runny mashed potatoes. It is roughly a 2 parts brain to 1 part water mixture. I usually do a 2 parts brain to a ½ part water and stir in more water if the mash is too thick. • Heat the brain mixture to warm it through, do NOT allow it to reach boiling temperature. • Rub the brain mash thoroughly over the hide to coat it. Roll up the hide and allow it to sit at least overnight, but preferably about 24 hours. • Stretching the hide again is the easiest and quickest way to scrape away the brain mash, but it can be done while laying flat. • Scrape away all of the brain mash and rinse the hide with either warm water or warm and soapy water. • Inspect the hide to make sure all of the mash is gone. • Repeat the brain mash application if the hide turns out too dry and is not pliable enough to work the leather and crack the membranes to soften it. I prefer this brain hide tanning solution recipe because the mash, or brain paste, has a daiquiri or Coke slushee consistency, making it easier to spread. It also seems to coat and adhere to the hide better than the mash recipe, in my personal opinion. • Mix and warm the brains and and water the same way you did to make the brain mash. • Pour the brain tanning solution into your food processor or blender and his pulse for about 30 seconds to 1 minute. • Repeat the same coating and stretching steps outlined above. Before the leather is completely dry after brain tanning the hide, you must being to “break” the membranes or work the hide. “Work” is the best way to describe this part of the process, fellow homesteaders. You WILL have sore hands and arms when you are done – no matter how great of a shape you think you are in physically. You are breaking the membranes in the hide to make them soft and pliable – and keep them that was permanently. A white cast will appear each time a membrane is broken, this will allow you to keep track of where you have worked the hide and where you have not. The boys had been working for three hours fleshing the cow hide when this photo was taken. My husband put a board up and slanted it outward to give our daughter Brea and I something hard to work against while de-furring the hide as James and A.J. Scraped. We eventually switched the board to their side to give them a hard surface to scrape against. Working with the wood shed as a backdrop for the hide would have been best, but the weather forecast for the next week was simply not cooperating. You put your hands on a small, very small, portion of the hide and work it fairly roughly back and forth until the membrane breaks – the motion is similar to how your would work out a stain on a shirt after treating it with a stain remover product. Some tanners prefer to rub their hide back and forth across the fleshing board or a tree to break the membranes. Tanners can get really creative when working the hide. Some slide it back and forth over a clothesline, other pound it, jump on it, or even chew on it like Native Americans once did. Choose whatever method or combination of methods your prefer, or dream up your own, to get all of the fibers in the hide broken, loosened up, and soft enough so the leather can be comfortably worn. The working process is a lot less necessary if making a wall hanging or rug out of the hide. I always work the leather to some degree even in these cases to prevent it from getting rock hard over time and cracking. We are finally to the last step in the hide tanning process! Not everyone still smokes their hides, so you could have called it quits one step back, but I would not recommend it. Leather that is not smoked just never seems to be as soft as smoke leather and it often stiffens back up a lot after getting wet an then drying again. Smoking the leather will help weather proof it and usually, deter insects as well. The resins create by the wood smoke attach to the fibers in the leather and harden them against the weather. Do not use evergreen or pine to smoke leather. This species of wood will generate tar in the resin and typically ruins the leather entirely. The key to smoking hides to generate a LOT of smoke but not flames or heat. The best way to get the right ratio of smoke and heat is by using rotten old wood and/or allowing the fire to burn down to the coals before hanging your leather. You can use posts or poles to create a teepee or cylinder over the fire to drape the leather around. Make sure to put the fur side of the leather on the outside away from the fire if you did not de-fur the hide. Do not use something solid to make your cylinder shape, you want the smoke to roll out of the support system above the flames and funnel out of the top of the system so the leather does not get scorched…or worse yet, catch on fire. You can also make a teepee-shaped cylinder or non-solid box large enough that you can hang several hides inside at the same time – like you do to smoke meat. How long the leather is smoked depends on the dimensions of the hide and personal preference. Checking the hide frequently during the process will make sure it is coated evenly and you can watch the color of the leather change and remove it when it reaches the shade you want. The process usually take about 30 minutes for most hides. Most tanners recommend oiling the leather after it is smoked and working in gently throughout the hide to increase softness and seal in the color. Neat’s Feet Oil is the most often used commercial hide tanning product for this task, but Mink oil is just as good, in my opinion, and something most homesteaders already having laying around for working on their saddles or kids’ ball gloves. Coconut oil, olive oil, almond oil, or vegetable oil can also be used. Some tanners apply oil both before and after smoking to help ensure the leather does not dry out too much and crack during the smoking process. • Mix an egg yolk with 1 to 2 teaspoons of water – depending upon the size of the egg. You will need less water with a Bantam chicken egg and more if you are using yolks from a duck or turkey egg. • Spread the egg yolk tanning agent mixture thoroughly and deeply onto the hide – I use a pastry brush or sponge to complete this process. • Cover the hide with a damp sheet made out of natural fibers if working with a large hide or towels if working with a smaller hide. • Allow the mixture to work completely into the hide a full 24 hours – waiting 48 hours sometimes works best. • Rinse the egg yolk tanning solution off of the hide and proceed with the tanning process. You can use the same castille soap or Fels Naptha soap you use to make homemade laundry detergent, for tanning your hides. • You must grate the soap like you do when making detergent, to make a natural hide tanning solution. • Mix the grated soap with just enough water to allow it to completely dissolve. • Pour in just shy of an equal part Mink or Neat’s Foot Oil. • Slather the solution onto the hide like your did the brain tanning solution. • Roll the hide up with the solution still on. • Allow the hide to sit in the soap tanning solution for 48 hours before washing it off and proceeding with the tanning steps. The amounts in this tanning agent recipe provide enough solution to tan 1 coyote or 6 rabbits. • Mix together 1 cup of non-iodized alt, 2/3 of a cup of washing soda, and 2 and ½ cup of alum. • Stir in approximately 3 gallons of very warm, but not hot, water. • Stir the mixture together until all of the ingredients have completely dissolved. • Soak the hide in the solution for at least two to three days before removing it to rinse clean and proceed with the tanning process. Using oak bark tea as a hide tanning agent is the prime method of choice by tanners who want a thick and durable leather that can be used to make gun holsters, belts, and horse tack. It often takes up to 100 pounds of bark to tan a cow hide. • Collect enough bark to fill a 5 gallon bucket – several 5 gallon buckets if doing a large hide. • Mix the bark with enough warm water to make a solution that resembles tea. • Clean the hide, or soak it overnight, in the oak bark tea solution AFTER straining the bark out of the liquid – catch the liquid, that has now been diluted by the water sprayed or dumped on it to rinse the hide, in a plastic tub or livestock tank. • If removing the hair, soak the hide in a de-furring bath of wood ash or lime solution, or a mixture of both. • Rinse the hide completely again. • Put the hide in bath with the diluted oak bark tea for 7 days. • Make another batch of bark tea. • Remove the hide at the end of 7 days and dump the diluted oak bark tea water. • Fill the tub with the new batch of bark tea and let the hide sit in it for two weeks. • Remove and rinse the hide and continue on with the tanning process. • Mix together 5 gallons of warm water and 1 gallon of distilled white vinegar. • After de-furring and/or fleshing the hide, soak it in the mixture for three days. • Remove the hide and rinse it clean using COLD water. • You will need to repeat the soaking steps three times to tan the hide. • The hide will be very still after the distilled white vinegar soak and must be oiled completely to soften the hide. I found this great tanning recipe in my husband’s Foxfire books – every homesteader should have a set of those incredible books! The recipe is simple, natural, and barely costs a dime. • After rendering your animal fat into either lard or tallow, smear it onto a de-furred and fleshed hide, covering it completely. • Next, pour flour over the lard or tallow, again, coating it completely. • Roll up the hide, like you would if using a brain tanning agent. • The Foxfire books say to keep the hide rolled into the solution until the “blood” is drawn out. In my experience, this takes at least two days, but sometimes 73 hours for large or thick hides. • The hides will turn out pretty stiff. After rinsing them and allowing them to dry almost completely, you will need to oil the leather. • Mix together equal parts mayonnaise and eggs. • Stir them vigorously or run them through your food processor for about 1 minute on the pulse setting. • Smear the egg and mayo tanning agent onto the entire de-furred and scraped hide, coating it thoroughly. • Now, you can either roll the hide up for 24 to 48 hours, or cover the hide with slightly damp sheets or towel made out of natural materials. • Rinse the hide and continue on with the tanning process. Oiling the leather is pretty essential when using this type of tanning solution. Try out different natural tanning agent solutions each time your tan, until you find one that suits your needs best and helps you churn out a great piece of leather. The amounts of the ingredients in each recipe are estimates based upon either past personal experience, or the experience of homesteading friends who have used the recipes and produced what I deem, in my “unexpert” opinion, as a really beautiful niece piece of leather. Have a natural tanning recipe we did not include in our report, or a different variation of one on the list? Share it in the comments section below so we can all give it a whirl, too. WE did the vinegar method, but my questions is what oil do you use?